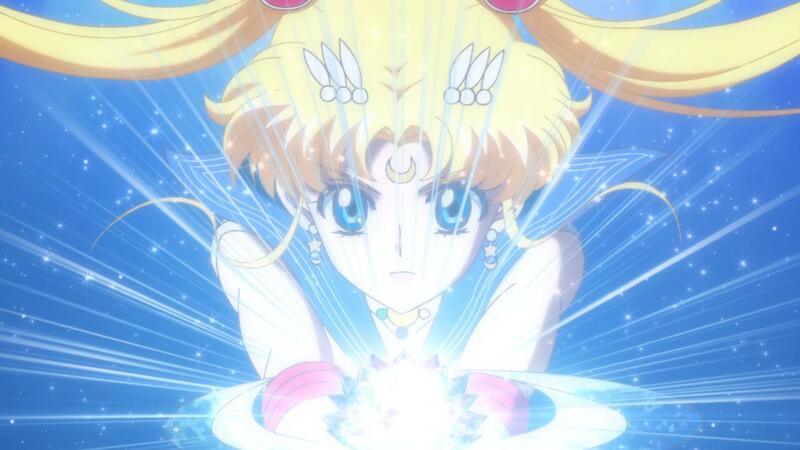 Sailor Moon attempts to defeat Queen Metalia, but her powers aren’t enough. Offering a prayer, apparently combined with the prayers of her unconscious companions, the power of the prayers head to the moon, where the giant crystal at the center of what was the Chamber of Prayers grows. 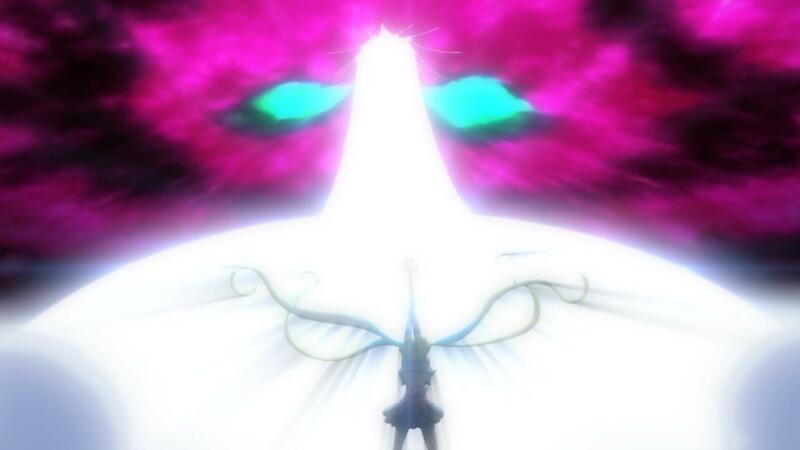 Luna adds her prayers, and thus Sailor Moon is able to defeat Queen Metalia. Chiba catches the unconscious Usagi, then kisses her to revive her, causing the Silver Millennium ruins to return to their former glory. 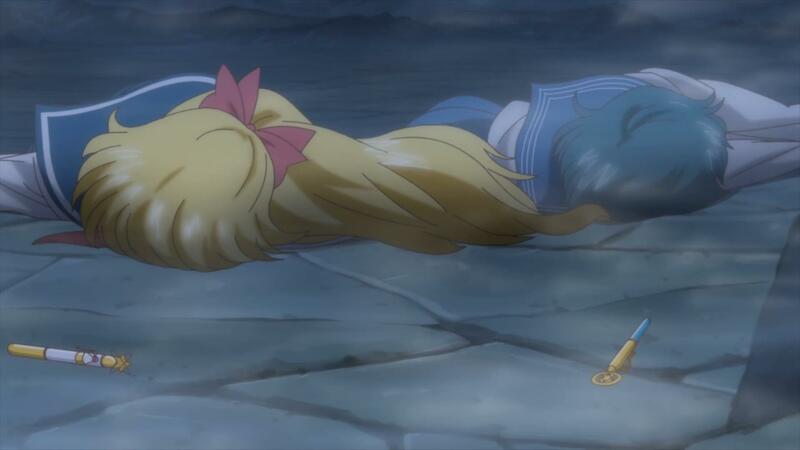 With that out of the way, Chiba uses his powers to locate where the other Sailor Senshi are. 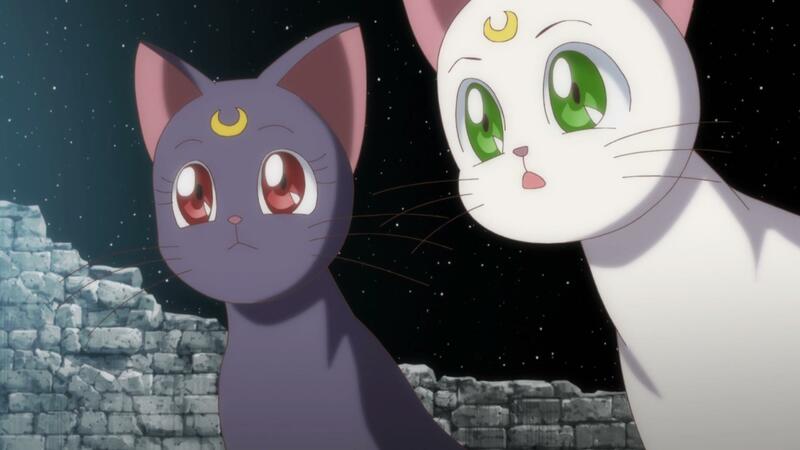 Luna has Usagi come to the moon via a new way since Usagi’s Sailor Moon broach was destroyed. Usagi turns down the offer to be Queen in favor of returning to Earth and her friends. 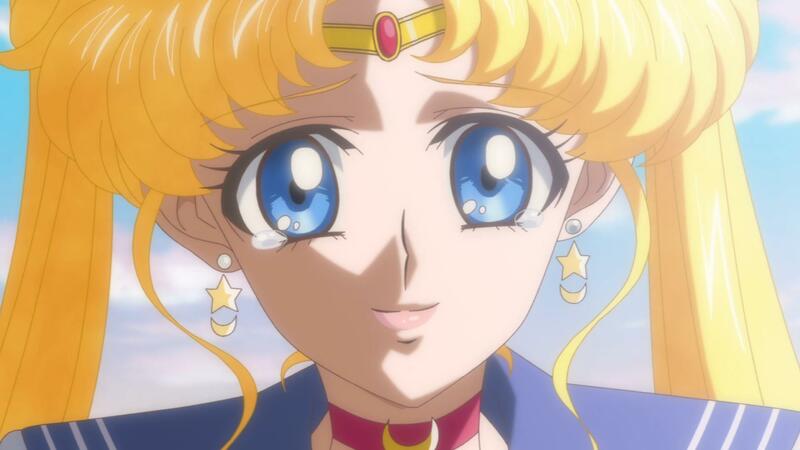 The former queen’s image appears and hearing Usagi’s reasons, gives her blessing. She leaves Usagi with a new broach, so as Sailor Moon, she restores Earth to the way it was, then returns there to reunite with her friends. Life returns to normal with the girls going back to school. 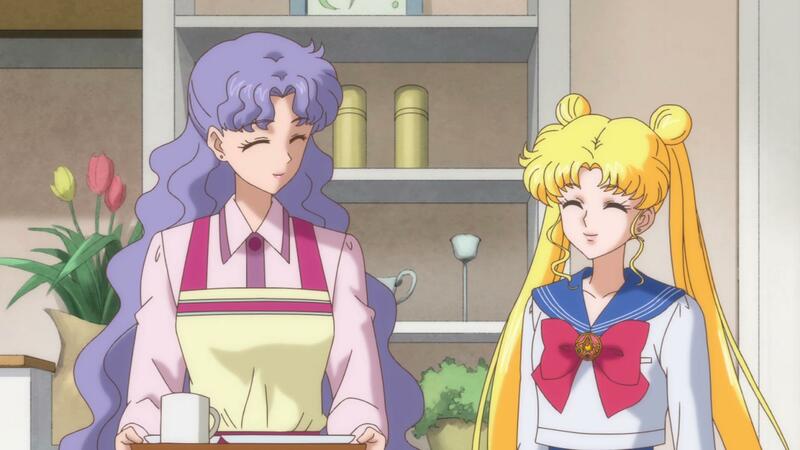 Usagi gets up early, but still forgot to do her homework. 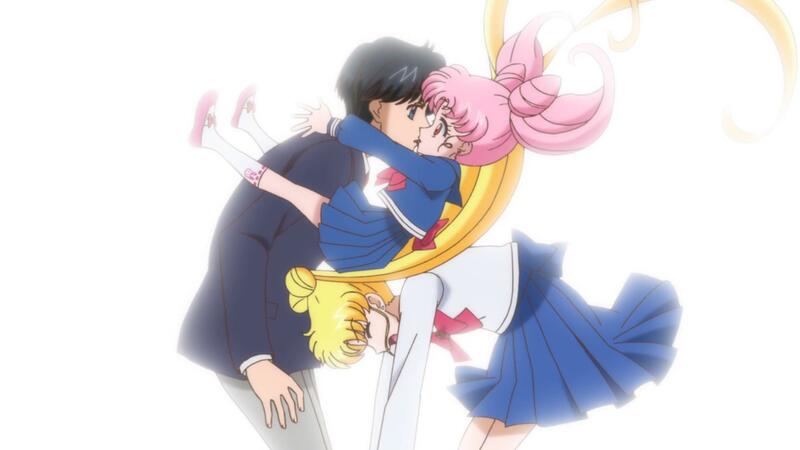 After school, she meets Chiba, where their snog session is interrupted by a portal opening and a pink haired girl landing on Usagi, kissing Chiba in the process. Upon learning Usagi’s name, the girl, also named Usagi, brandishes a gun at the original Usagi, demanding the Legendary Silver Crystal. The resolution to everything is pretty cliched. Wish hard enough and your wish will come true. Thankfully, Queen Metalia wasn’t that interested taking over the world since she allowed Sailor Moon to just do whatever she wanted in order that Queen Metalia could be defeated. Also, a good snogging with extra tongue (which will be an Easter egg extra on the video release) will wake up any babe. Well, it worked for Snow White way back when, so why not today? Is it bad that I laughed every time the episode went to have a look at our unconscious Sailor Babes? I kept thinking, “Man, how worthless you girls are.” If I were Usagi, I wouldn’t be able to trust that they wouldn’t be knocked out by a sudden gust of wind (not that Sailor Moon is anything much above that). Fortunately, this terrible story arc has completed, though a new one begins. 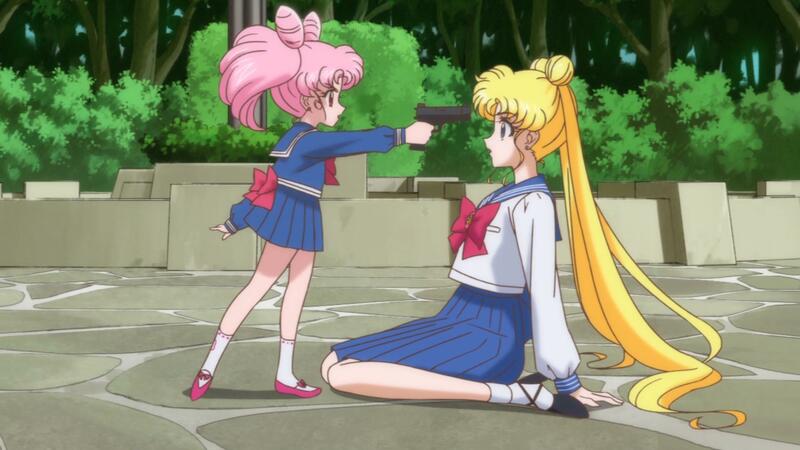 As to loli-Usagi, I laughed at her brandishing a gun on Usagi. I think I know whom loli-Usagi is as some years ago, I did some poking around in the Sailor Moon lore for some reason that now escapes me. I don’t know any of the story from here on, so everything will be new to me. Although I’ve found Sailor Moon Crystal to be rather obnoxiously tedious and laughably stupid, there’s a part of me that is sorta curious as to the story from here forward. Brandishing a gun is stupid. I say just watch the original Sailor Moon anime (1992-1997) instead, it’s far superior even if its fourth season isn’t that good. Characters are more useful and developed, better fight scenes, better art/animation, and the story is even improved upon the original manga story (that’s what Crystal tried to adapt here but failed miserably). 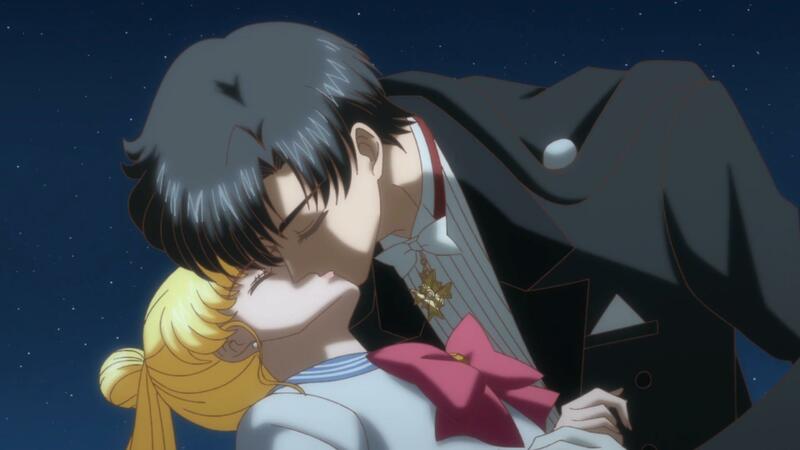 I do have the original Sailor Moon anime on my list of things to watch.